I treated myself, and my family, to a mother's day new cookbook: Handheld Pies. It caught my eye because I am a lover of the crust in a pie more than its filling. With the small handheld and jar pies, the crust to filling ratio appears to be in favor of the crust. This is very appealing to me. Plus they're cute and handy to eat because of their contained sized. I'm going to be trying out several versions of these pies over the next few days. Stella chose peanut butter pie to start. A few measurements have been slightly altered from the original recipe. 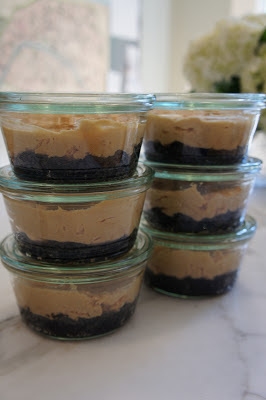 Divide the crust mixture evenly into 6 jars. Press the mixture into the bottom and slightly up the sides. Bake in the oven at 350f for 10 minutes. Let cool completely before filling. Using either a standing mixer or a handheld mixer, whip the cream until soft peaks form. I used a hand mixer for this and the rest of the recipe. Set the cream aside. In a large bowl, combine the cream cheese, peanut butter, sugar and vanilla extract. Beat on medium-high until the mixture is smooth and creamy. Use a rubber spatula to fold in the peanuts. Fold in about a third of the whipped cream and then gently fold in the remaining whipped cream until no white streaks from the cream remain. Divide the filling into the jars. Smooth the tops. Cover and refrigerate for at least 1 hour or up to 3 days. To serve, sprinkle with some chopped peanuts and perhaps a small scoop of vanilla bean ice cream. Wow, that's a rich pie! Hurt me!